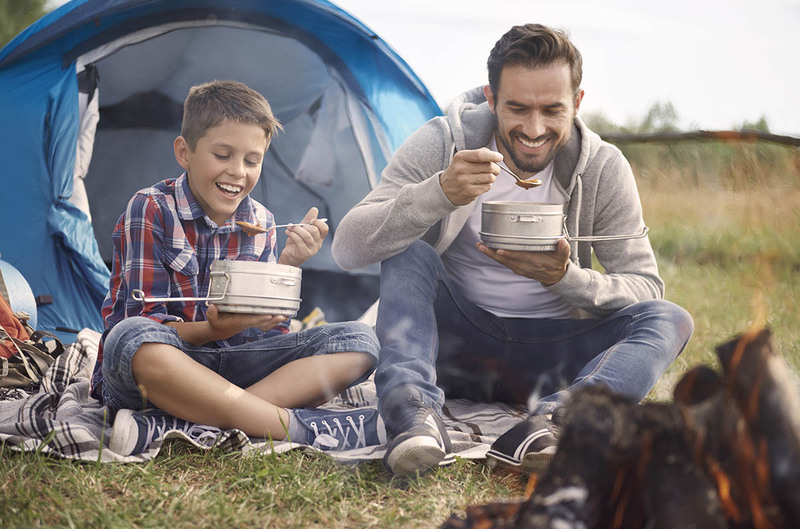 Camping is seen as a traditional father son bonding and teaching rite of passage, and it is probably as important as ever in the time of mobile devices and Wifi. For some families, spending time together is important and getting to know your kids is one of the best ways to keep them out of trouble. This is one of the reasons why father-son bonding time is important. It helps to cultivate a relationship between two members of the family so that they grow closer and come to understand each other. Here are other reasons you should take your son to a father-son camping trip. When you’re at home with the family, you’re always distracted by responsibilities and technology. You have to take out the garbage, fix something that is broken, run errands or attend to your other children. There may be no one-on-one time with your sons because they also have things to do like homework and chores. But when you’re camping, there are no distractions like chores or other kids. It is just you, your sons and the outdoors. There are also limited gadgets outdoors. Sure, you can bring your cellphone and tablet with you but you also have to conserve battery for emergency or when you’re really bored. This distraction-less environment is a great opportunity to just be together and get to know each other. Now that camp has been set up, firewood has been piled and the food is slowly cooking on the fire, there’s nothing left to do but talk. Conversation is one of the best ways to get to know your boys. You can find out what they like, their interests or maybe if they have a girl in mind. There’s lots of time to talk outdoors. You can do it while fishing, setting up camp or when you’re relaxing. There’s no distraction and limited diversions so talking is not just a communication tool but it can be entertainment too. There is nothing like camping to teach your sons about the importance of cooperation. When you’re camping somebody has to forage for firewood, set up camp, look for water and perform other camping functions. An extra hand always makes chores easier but fathers and sons need to learn about cooperation to make sure that things go smoothly. There is also a shared sense of pride when fathers and sons accomplish something together. Dads are typically busy people. They have a lot of things on their minds so it is understandable that many of them have a jaded view of the world. However, even the most jaded dad will lose their breath when they look up at the millions of stars in the sky or when they lock gazes with a deer. The beauty of nature is stupendous and sharing that sense of wonderment with your sons can be a once in a lifetime feeling. This is why we camp and imparting this feeling with sons is one of the best ways to appreciate nature. Camping is a good way for dads to strengthen their paternal bonds with their sons. It is a great way to understand and get to know each other’s personalities. Next time you want some one-on-one son time, consider camping and backpacking activities.